Last December I was invited to a Ruger event at the famed Gunsite shooting facility—-conveniently located near Ruger's Prescott, AZ, plant. 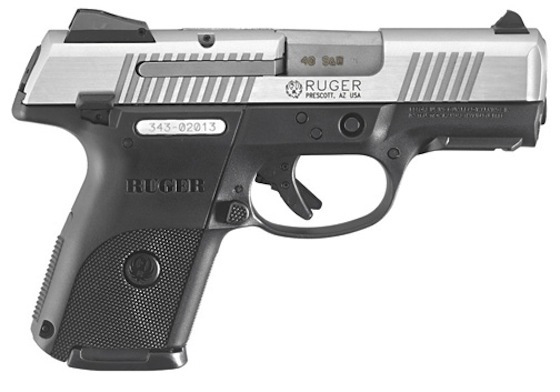 There, Ruger unveiled three new firearms: the Gunsite Scout rifle, which was featured on the cover of May/June 2011 issue of RifleShooter; the SR-1911, the company's first-ever 1911 (a review of which you can see on Handguns TV); and the SR40c, a compact version of the SR40, itself a relatively new pistol. 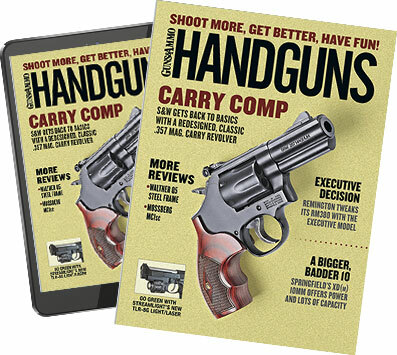 The rifle was introduced a few weeks afterward, and I had written up the 1911 and the SR40c for inclusion in Handguns' annual new gun preview (April/May issue). Then, just as we were going to press, I heard from Ruger: The introduction of both handguns was being postponed, and I had to pull the write-ups. The 1911 was announced at the NRA show in May, and, finally, today—six months after the Gunsite event--Ruger unveiled the SR40c to the public. The gun features a 3.5-inch barrel and an OAL of 6.85 inches. It's 4.6 inches high, and width is the same as the SR40: 1.27 inches across the safety levers. Weight is a svelte 23.4 ounces. The SR40c comes with adjustable three-dot sights, and an accessory rail is molded into the glass-filled nylon frame. If you're familiar with the SR9, which was introduced a few years ago, you know about the reversible backstrap. Simply drive out a pin and choose either flat or rounded strap, whichever fits your hand best. The gun features a visual and tactile loaded-chamber indicator, striker blocker, trigger safety, magazine disconnect and an ambi frame-mounted safety. The mag release is likewise ambidextrous. At Gunsite, everyone was drawn to the 1911, but I was just as impressed with the SR40c and shot it quite a bit. The pistol comes with a nine-round flush magazine along with a 15-rounder that fits seamlessly into the grip courtesy of an extension that slides over the magazine. I didn't have the opportunity to shoot the nine-rounder, but I shot the 15 with and without the extension--the latter in one of Gunsite's shoot houses as part of a room-clearing exercise--and found it quite controllable and accurate in both configurations. I don't recall Ruger discussing this at Gunsite, but according to the press release, the magazine bodies are treated with an anti-friction coating to reduce the effort required to load the magazines fully. Perhaps it's something the pistol's designers decided to add since the intro event. If you're looking for a very concealable, nice handling (for a subcompact .40) pistol for carry, the SR40c is definitely worth checking out. While it's not approved for Massachusetts, it is on the California approved list (and ships with nine-round mags instead of 15 for CA). All-black and black/brushed stainless options are available, and the gun has a suggested retail of $525.